Handling passenger baggage with care is part of every cruise ship call but there was a special assignment for SCH when the luxury cruise vessel Azamara Quest called in Southampton at the end of an 11-night cruise to ports located near some of the UK and Ireland’s most famous golf courses. The specialist golf cruise included a visit to the British Open at Troon and the opportunity for more than 100 golfers to play at leading courses, meaning an essential feature of the luggage were their prized clubs. For those who did not take their clubs on board, a van was even detailed to meet passengers at each port to deliver their clubs ready to play, culminating in the arrival in Southampton where SCH took on the caddy role to ensure that owners and clubs were reunited. Just under 700 passengers made the trip and a careful operation was required to return the valuable golf bags to their dedicated owners. 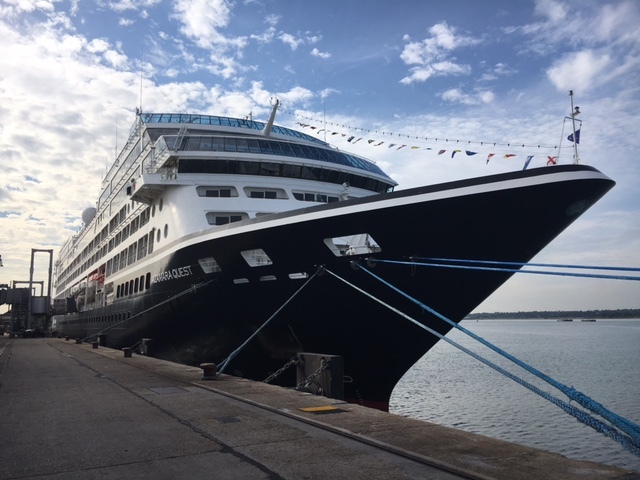 Azamara Quest’s turnaround then included nearly 700 passengers embarking for the subsequent cruise to Northern Europe.